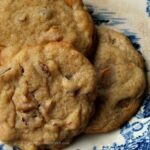 If you love the flavor of butter pecan ice cream you'll love these easy, chewy, drop cookies! Toasting the pecans and using salted butter gives them more authentic flavor. Let cool for 10 minutes on the pans before removing to the counter to finish cooling.